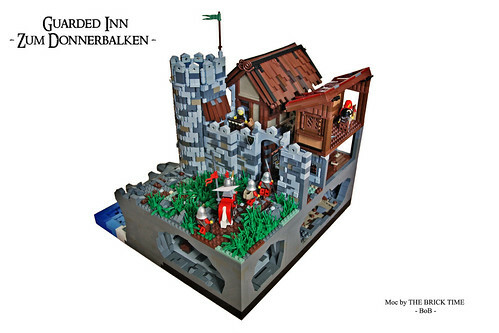 Classic-Castle.com • View topic - Guarded Inn "Zum Donnerbalken"
Here the newest moc from THE BRICK TIME building yard. 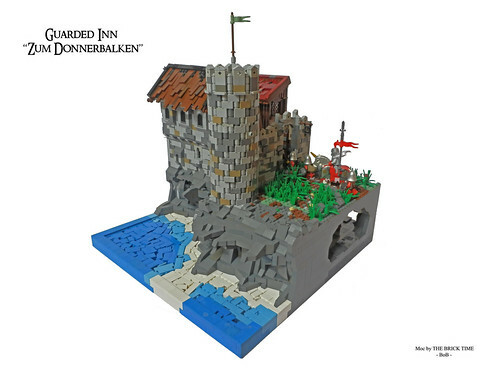 The guarded inn "Zum Donnerbalken". Located in the northland, near the 1. Reichsstraße. See the all pictures at our FlickR gallery. Re: Guarded Inn "Zum Donnerbalken"
The mottling and roof(s) look terrific! Great job! Also, welcome to Classic-Castle (CC)! Looking forward to more from you, judging from the quality of this MOC! Thx for the warm welcome. Mark was already taked at the first picture of the "Donnerbalken" in my FlickR Gallery. Looks really great! Although more like a fort than an inn... Must be expensive. But really, interesting water technique, and the basement thing is pretty interesting. THE_BRICK_TIME_Team wrote: Mark was already tagged at the first picture of the "Donnerbalken" in my FlickR Gallery. That's what I get for not going through all of the pictures. Nice of you to give him credit. I just saw it and thought of him so added him so he could see that his technique is catching on. Great rocks, by the way! Mark has done a really great job with his water-techniqs. It was my duty to honour this. I've always loved your MOCs, welcome to CC! This newest MOC is really nice. I particularly like the water technique, also the rough shingles on the roofs. I also like how the buildings are so close together - makes it seem very realistic to me. I love the rocks, and the weather-worn look of this whole MOC. The mottling on the building is great, and I like the wooden roof. and tanks everybody. Unfortunaly it last much to long to register on CC. I like to see the high quantity of great mocs on cc. This amazing.